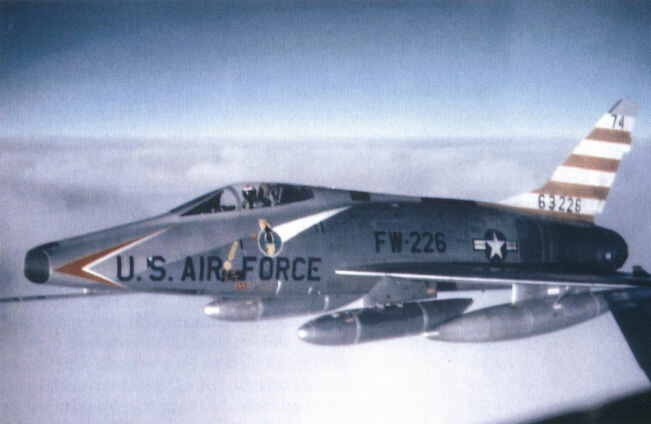 F-100D 54-2128 of the 492nd FBS flying over home territory in uncharacteristicaly fine weather. The squadron colour, in this case blue, was carried on the fin. John Wainwright flies south on a Special Weapons training deployment. 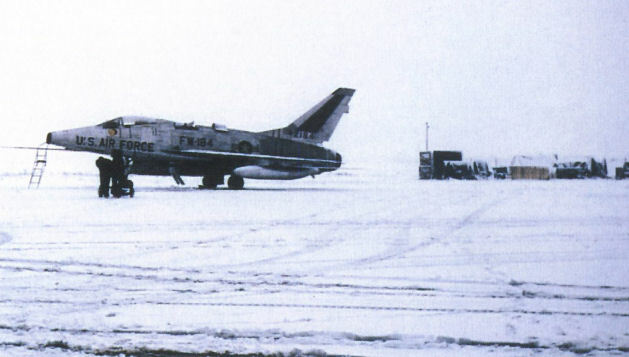 F-100Ds of the 493rd FBS lined up at Wheelus. The winter of 1957 was a particulary harsh one at Caumont, but it was business as usual. F-100D 54-2222 at Chaumont in 1956. This was the CO's aircraft and carried the three squadron colours on the tail. F-100Ds of the 492nd FBS on the flight line at Wheelus in 1957. F-100Ds of the 493rd FBS over central France in 1958. Jack Tomes en route to Wheelus in 1959 in 56-3226.